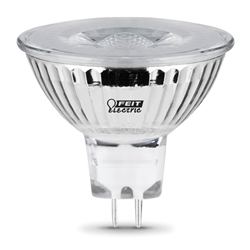 Enjoy all the benefits of advanced LED energy-saving technology with the Feit Electric BPEXN/930CA 50W MR16 LED Light Bulb. This 3000K bright white bulb is dimmable and will replace a 50-watt equivalent incandescent bulb. It produces a similar light output (500 lumens), uses 6.6 watts of electricity and up to 87% less energy than a standard incandescent light bulb.